This entry was posted in Art Monthly Monthly and tagged analyses of black identity, artists as a counter-force on economic rationality, beyond identity constructs, black identity 2013, dave beech, economic exceptionalism, economics of art, exceptionalism, flaw in neoliberalism, identity construction, identity constructs, iniva, marxism, Morgan Quaintance, second post-colonial generation on October 28, 2013 by artmonthly. 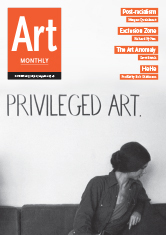 In this month’s Art Monthly show host Matt Hale talks to Peter Suchin about his review of Terry Smith The Foundling at The Foundling Museum, Colin Perry’s review of Chen Chieh-jen at InIVA and Dave Beech scrutinises the face of Conservative cultural policy in the form of Roger Scruton’s new book on Beauty. 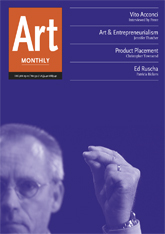 This entry was posted in Art Monthly Monthly, Shows, Uncategorized and tagged adorno, aesthetics, alain badiou, art monthly, beauty, chen chieh-jen, clive bell, colin perry, conservative arts policy, conservative cultural policy, contemporary art, dave beech, dialectics of enlightenment, ethics, foundling museum, iniva, matt hale, nihilism, peter suchin, philosophy of beauty, roger scruton, terry smith, The Philistine Conspiracy, veronica wadley on January 12, 2010 by artmonthly.